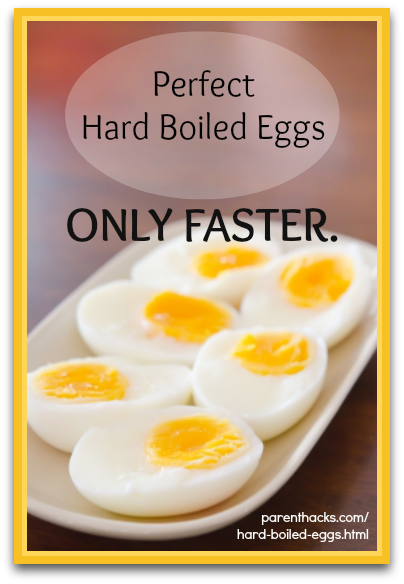 Perfect hard boiled eggs, only faster! Update: I’ve recently discovered the Instant Pot electric pressure cooker, and it’s now my absolute favorite way to hard boil eggs. As with the stovetop method below, the eggs are steamed, but with the Instant Pot, there’s no supervision required. Another big bonus: because the steaming occurs under pressure, the shells come off effortlessly. 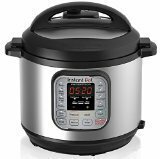 The Instant Pot is my new favorite kitchen appliance — not only does it cook meals in record time, it has replaced my slow cooker and my rice cooker. Add 1 c. of water to the inner pot and fit it with the included metal steamer. Place 4-5 eggs directly on the steamer and close and lock the lid (don’t forget to turn the vent to “Sealing”). Using the Manual button, set the time to 6 minutes, and press the Pressure button to select Low Pressure. The Instant Pot will beep once to let you know cooking has begun. Hard boiled eggs are my daughter’s favorite new snack, and I couldn’t be more thrilled. High protein, all natural, simple. But the classic boil-in-a-pot method isn’t quick as I might like. Turns out you can steam eggs on the stovetop resulting in perfect hard boiled eggs in a fraction of the time. It’s not that the eggs cook more quickly — it’s that the water boils more quickly. You can go from a refrigerated raw egg to a delicious warm snack in about 10 minutes. 2. Put 1-2 inches of water into the pot. 4. Remove from heat and fill the pot with cold water to stop cooking and cool the eggs. 5. As soon as the eggs are cool enough to handle, peel and eat! Or pop in the fridge for later use in salads, sandwiches, or one of my favorite pantry dinners, hard boiled egg curry. Thoughts? Can anyone improve on my hard boiled egg technique? Asha – this is definitely the best way I know of to hard boil eggs. I’ve been doing it this way for years with one exception: Just put the eggs in cold water and heat everything together. It’s safer than trying to plunk the eggs into hot steaming water afterwards. I use the minimum amount of water possible, like less than one inch. Tip: Once the water is boiling turn the heat down! The temperature of the water can only reach 100C or 212F, it doesn’t go higher, so more heat just increases the rate of evaporation, which does not help. Boil at high power, and then turn down the heat to maintain boiling temp. Chris: AWESOME. In fact, I did this (cold water + cold eggs). Fantastic point about turning the heat down. As for Tim Ferris’s method…will check it out. That guy boggles the mind. i put eggs in cold water, bring to a boil, take off the heat & cover, let set for 12 minutes, cool off. I will have to try this — was doing the Julia Child method, which includes two ice baths. Works beautifully (no green ring!) but is a PITA, so I don’t do it as often as kidlet would like! This is the method I use, except I turn off the heat as soon as it starts boiling (and I leave it covered the whole time, until the 11 minutes are up). Susanor: the green ring is generally caused by overcooking– I never get green rings with this method/time. My kids had hard-boiled eggs in their lunches today, in fact. Add some salt to the water – it doesn’t flavor the eggs but if the shells crack from boiling too hard, the insides will stay inside the shell. We steam in our rice pot! It has a steamer tray, a little metal inset with holes in the bottom. Since we make a pot of rice once or twice a week anyway, we have just learned to put three to five eggs in the tray each time we make rice. Time-wise, it takes about twenty minutes, but if you don’t mind the eggs a little harder (like we do for egg salad) then you can just leave them in there until the rice is done. BKC! This is brilliant. I am still discovering everything that’s possible with a rice cooker. I’m going to post your tip on the site for all to appreciate! We just started to bake our eggs; and will never go back to sovetop. One egg each in a muffin tin. Put on middle rack of the oven. Turn oven to 350. Set timer for 30 miutes. Timer goes off, put eggs in ice bath. No ring, very creamy, less fuss. I put my eggs in an electric tea ketlle (gently), add cold water, turn on the kettle and after it “pops” or boils, let sit for 10(soft) to 15 min (hard) before removing from the kettle and placing in ice bath or cold water to stop cooking and cool for peeling! Discovered this after searching for quick hard boiled egg methods for my food prep. Have just tried it and it’s fantastic! Eggs turned out perfect and peeled beautifully! Thanks!